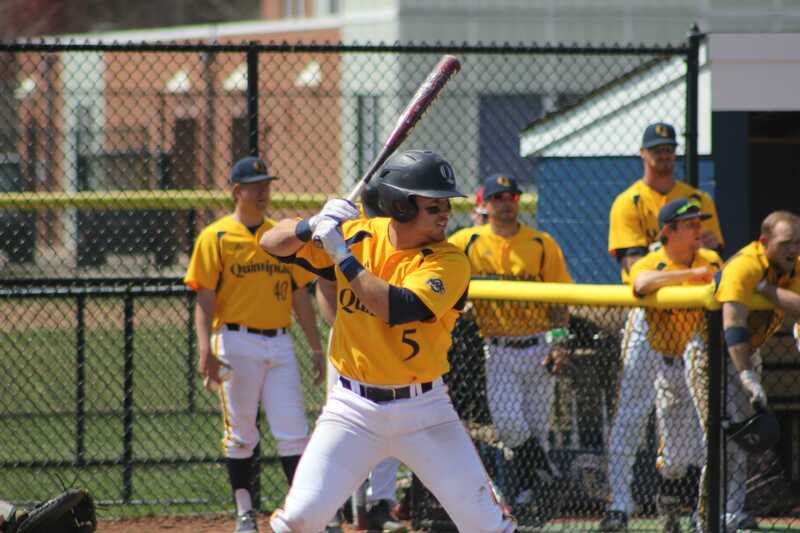 Becoming the starting third baseman on a Division I baseball team, earning all-state honors and managing course work as an athletic training major can be a lot, but it’s just life for Quinnipiac sophomore third baseman Evan Vulgamore. Vulgamore, a native of Bow, New Hampshire, flourished at the high school level. During his senior year, he had a .646 batting average (BA) and hit five home runs (HR). He also earned all-state honors for all four years. This was enough for Quinnipiac head coach John Delaney to take notice. Choosing the right college can be tough for anybody. Luckily for Vulgamore, he felt an instant connection to Quinnipiac when going through the recruitment process and Delaney was a big part of that. Vulgamore is also dedicated to what he is doing off the field. He is an athletic training major and it can be tough to manage practice and game times with the course, but for Vulgamore it is a skill he feels is necessary to learn. Vulgamore had a tough start to his Quinnipiac career during his freshman year. He had a .172 BA, only producing eight hits and 15 RBIs while hitting just one HR. He played in 31 games and made 23 starts. Vulgamore was not alone, as he had help along the way not just from Delaney, but from some of his teammates, including senior first baseman Ben Gibson and graduate student relief pitcher Wyatt Hamilton. Vulgamore also credits the mentorship he’s gotten when things don’t go his way on the field. Vulgamore has turned it around during his sophomore year. He currently has a .288 BA with 36 hits, seven doubles, six HR and 24 RBIs in 36 games. “I definitely learned how to fail,” Vulgamore said. “I didn’t have the freshman year everyone thought I would and now if I have a bad game I don’t let it get to me because I know I have another game the next day. What makes a college baseball player stand out is being able to play at the same level defensively and offensively. Being better at one only creates a disadvantage for the player. Versatility is as important as ever showing coaches that a player can field multiple positions at a high level. 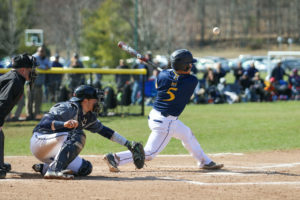 With Vulgamore having to move from blocking balls behind the plate as a catcher, to fielding ground balls at the hot corner known as third base, Delaney mentioned how he feels the process is going. Tommy John surgery is necessary when an elbow suffers a tear, so players have surgery to replace it with a tendon or another ligament from a donor. For a baseball player, it affects their throwing because they aren’t able to throw with the same mechanics as before and you either come back throwing faster, slower or the same as before. Training isn’t the only thing that Vulgamore credits towards his improvements. That family atmosphere is something that is keeping Vulgamore working harder and harder each time he takes the field or steps up to the plate. For the Bobcats, they are currently 16-18 overall and 8-1 in MAAC play, their best start under Delaney, who was been at Quinnipiac for four years. Vulgamore sees that this team has the potential to go a long way and he’s glad that he’s able to contribute to it.